In a perfect world all companies would operate fairly, with ethical sourcing practices. Unfortunately, that isn’t always the case. That’s why third-party fair trade certifications have emerged to ensure growers receive at least a living wage. This Fair Trade Month (October) we’re celebrating social and economic sustainability, especially in the growing number of companies that embrace ethical practices beyond certification. One of these companies is Agostoni, our sourcing partner for premium organic and non-GMO chocolate and cocoa ingredients. In 1988, Dr. Agostoni saw the potential of Dominican cocoa and began working with the CONOCADO cooperative. Because of their success with improving quality and yield, other cooperatives on the island quickly began imitating CONOCADO. The Dominican Republic has since been recognized by the International Cocoa Organization (ICCO) for “Fine or Flavor” cocoa. CONOCADO now involves 10,000 farmers growing cocoa across 28,000 hectares of land. Agostoni taught tree care, propagation techniques, and proper fermentation and drying processes to improve bean quality and ensure higher payments to farmers. 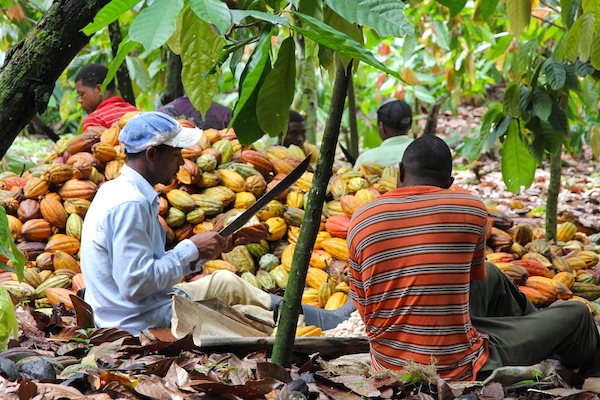 Farmers received support to help to set up and manage cocoa collection centers. Guaranteed business and premium price allows co-op communities to have money to build schools, health clinics and expand social programs. Agostoni’s request for organic cocoa drove the conversion of farms to organic methods and farmers received support to achieve certification. Now, they have 15,000 acres of certified organic land and farmers are able to collect price premiums for organic beans. Dr. Angelo Agostoni has a working relationship with a cacao farming community of over 2,000 families in the Huallaga Valley in the San Martín region of Central Peru. 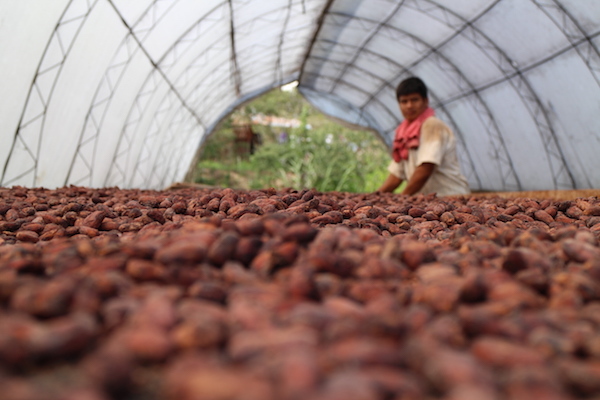 In Peru, growing cocoa has become a safe, legal alternative source of income to the drug trade. Botanical expertise is provided to farmers to support and improve the quality of Peru’s unique cocoa varieties. They now have about 15,000 acres of organically farmed land dedicated to their needs. The promotion of shade grown cocoa, which requires fewer chemical inputs, protects soil fertility, preserves wildlife and allows for intercropping to provide additional income to farmers. Farmers have access to a full-time quality and fermentation expert as well as training and consultancy support. Four drying centers have been established to improve cocoa bean quality and consistency and secure higher payments for farmers. Long-term supply contracts have improved economic conditions, for example, enabling the organic cocoa farmers’ cooperative in Alto Huallaga to secure bank credit. At Global Organics, we are proud to partner with Agostoni as the exclusive importer for their premium chocolate and cocoa ingredients in North America. Their commitment to social, economic and environmental sustainability is truly inspiring. To learn more about our organic and non-GMO chocolate and cocoa, contact your Account Manager or email info@global-organics.com.